This is the backside of the card. 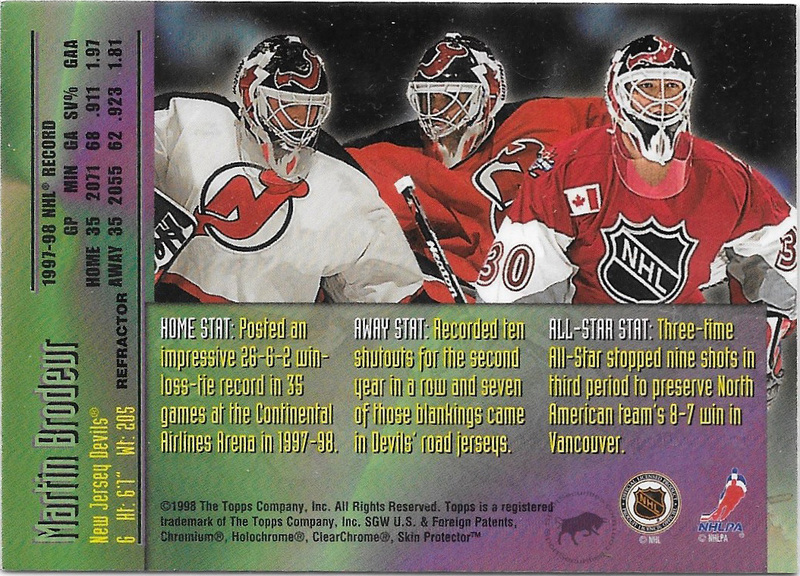 Notice the word "Refractor" running parallel to Brodeur's name in the lower left corner of the card. This is the front side of the card. 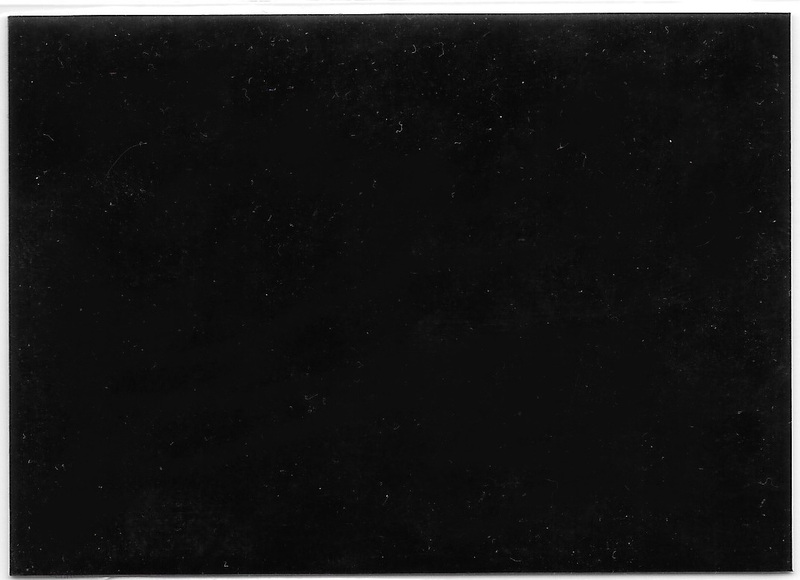 The black film completely obscures the identity of the card. A short time ago, I was grinding through a dollar box at a show when I came upon an unpeeled 98 99 Topps Mystery Finest Martin Brodeur Card (M12). At the time I knew I had found something special, but it wasn’t until sometime later that the reality of what I had found really set in. So, before I begin on the card, let me give a bit of info on this set, because it can be a bit confusing. The 98 99 Topps Mystery set consisted of 20 cards found as inserts in 98 99 Topps Hockey. They were called “Mystery” Finest because each card had a black film that covered the front of the card. The back of the card did not contain the film, so it was easy to tell what player was on the card. The actual mystery was that each player card was found in three variations, and the only way a collector knew what variation they had was to peel the black film off of the front. The three variations found were Bronze, Silver, and Gold. Bronze was the easiest variation to obtain. They were seeded 1:36 packs and featured the depicted player in their home jersey. Next was the Silver variation that was seeded 1:72 packs. This version had the player in their away jersey. The rarest variation was the Gold. This version was seeded at 1:108 packs and showed the player in their All-Star jersey. To further complicate the set, each variation could also be found in refractor parallels. These were seeded in packs as follows: Bronze refractors 1:108, Silver refractors 1:216, and Gold refractors 1:324. When I purchased the Brodeur card, I knew that it was most likely the Bronze, but when I got home and inspected the card further I realized that whatever was under the film was also a refractor. At a minimum of 1:108 packs, this Brodeur refractor card is awesome, and has entered a new level of unknown. Now, the question is what to do with it? Should I peel the card and find out if it is one of the rarer versions, or should I leave it in its mysterious state preserving its secret for eternity? The gambler in me says “peel it!” But, the collector in me thinks there are very few of these cards found in their original condition and I should archive it in the PC as is.